IMPORTANT: Please bring all materials that came with your textbooks, CDs, DVDs, and/or unused online access cards. The textbook will be required for next semester. The College Store needs additional copies to satisfy estimated enrollments. The textbook is complete and in saleable condition. When The College Store textbook quantities are filled, you may elect to sell your textbook to the off-campus USED book buyers. They will pay you their wholesale price, which is usually significantly less than 50% of the NEW price. They are purchasing that book for shipment to their warehouse and are only SPECULATING that they can resell your book to another college campus. 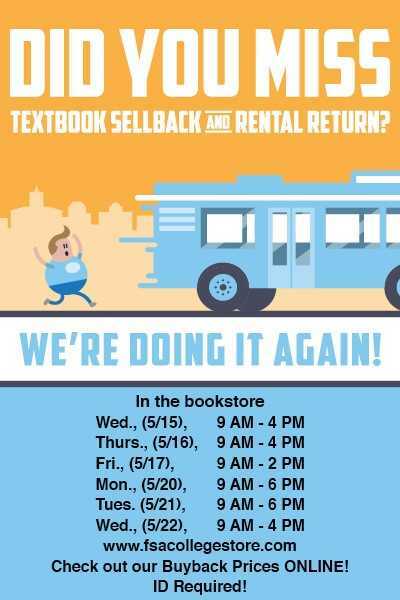 BUYBACK of textbooks occurs OUTSIDE The College Store, usually at the end of a semester during Finals Week. No receipt is required. RETURNS must be made INSIDE The College Store within 10 days of purchase and must be accompanied by a cash register receipt. They usually result in a full price refund.